Having personally known both Frank Gifford and Howard Cosell for many years, the following tale told by Gifford to Glenn Beck personifies the wonderful, forgiving person Frank Gifford was. I believe it is worth repeating. "He almost didn’t, and Kathie Lee said, 'It’s the Christian thing to do. You got to do it.' He said, 'He was a horrible guy to me. You know, and a horrible guy to everybody.' But he did. And Frank told me, it was the best thing he ever did. He said he went and he talked to him and sat with him. And he said he cried and cried and cried and didn’t know — really didn’t understand. "He went and visited him every week until he died. And nobody — nobody knew what was going on. But even Howard’s family didn’t come to visit him. 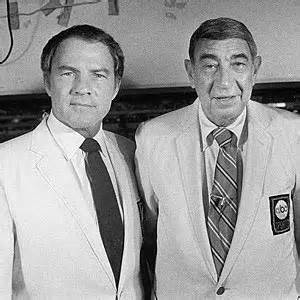 And it was in the end, just Frank Gifford, that went and did the right thing and comforted a man who was in his last days. I am truly sorry for the loss of Frank Gifford because of his family. His family is wonderful. His wife is remarkable. Just a remarkable woman. And Frank Gifford was one hell of a guy."